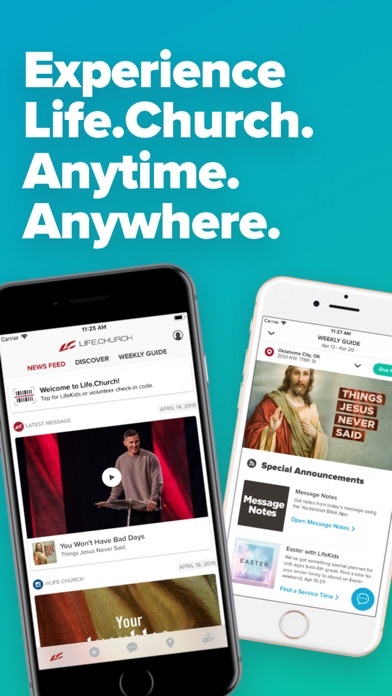 With the Life.Church app, you can experience Life.Church anywhere! 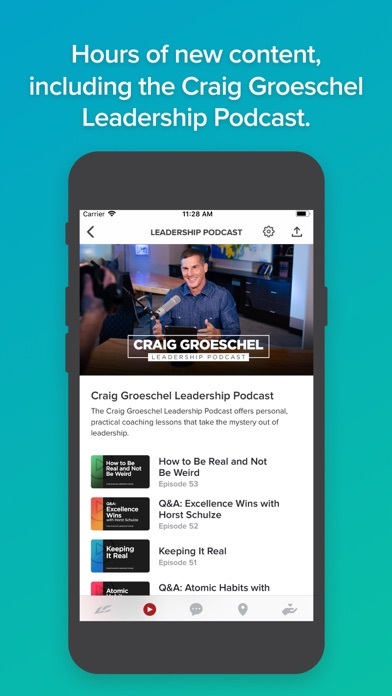 • Watch or listen to messages from Senior Pastor Craig Groeschel • Download audio and video messages for offline playback • Connect with your Life.Church campus or Church Online • Follow along with the service in the app with the Weekly Guide • Request prayer, submit questions and much more through the contact card • Check-in your kids for LifeKids or check-in to serve through the app • Invite your friends and family • Give to Life.Church • And more! 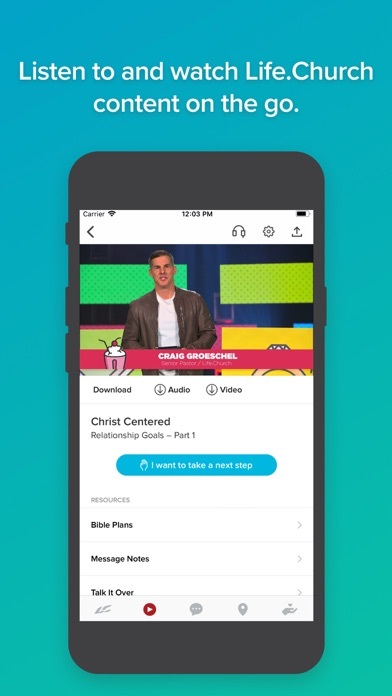 The latest version of the app has many updates to help you grow as a fully devoted follower of Christ. 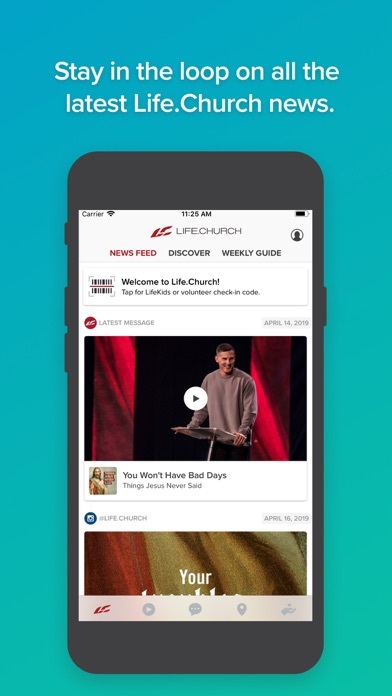 Download the Life.Church app today to be part of our Life.Church community as we take the next step in our journey with Christ together! About Life.Church: Life.Church wants to make a lasting difference in your life, in our community, and in the world. Our mission is to lead people to become fully devoted followers of Christ. That's how we're able to make a difference, and it's the driving force behind everything we do. We meet in physical locations around the United States and globally online at live.life.church. Great app to watch services! Pastor Craig gives the most powerful sermons on important everyday topics. Downloading this app has forever changed my life and my faith! I LOVE LOVE LOVE THIS APP! Love Life.Church and love this app! Most awesome content ever!! However, the ine flaw I wish someone would fix is that it keeps crashing on Amazon Fire Stick! Please take a look and fix that and it will be 5 stars.. and I’ll be able to host lifegroups from my tv. If you're like me, FOMO (fear of missing out) is a real thing. So if you go to Life.Church or Church Online, when you miss church you miss a LOT! With the app, I'm always in the loop, it's easy to sign up for whatever's coming up, and I can share the message or invite people with a quick click of the button. You need this app! Lots of valuable tips, insights, and introspect gained here. I have found the notes a quick snapshot with big ideas, but listening through each session is where the awe moments pop. Well worth the 20 min investment!! Love how easy it is to dig into content. I can get the access to the entire sermon archive, all the music, and even kids/youth videos. Even download them to watch and listen so not to rack up mileage on my data. Check in is a nice feature! Always improving and getting better. Pastor Craig, you have absolutely changed my life. I had been searching for a church home for years, pretty much my whole life. I suppose I had always been a "Christian atheist". I believed in God, but never truly followed, served and trusted in Him. My sister had asked me for at least a month to come to church with her, my response was "what is this, a cult or something?" I came the next weekend, just to make her leave me alone, but little did I know, that this experience would change my life forever. As soon as I got out of my car, someone in a golf cart came up to my son and I, asking if we would like a ride to the doors. As soon as I walked in the doors, I could feel it, I felt like I was home. I was so enthralled with emotions that I couldn't quite understand, it was absolutely beautiful. We started walking to the LifeKids side and Mr. James Meehan, walked up to us and greeted us, showed us around and made us feel so incredibly welcome! I checked my son in to LifeKids and went to service, guess what I did at the end.... that's right, I raised my hand so high and proud with tears running down my face. I was baptized a few weeks later. I jumped on this amazing train ride and I never want to let go. God has blessed our lives in so many ways in a little over a year. I am so thankful and grateful. Thank you, Craig! Your stories, your candor and your humor, it is absolutely wonderful! Your word is so amazing. My husband and I listen to your messages pretty much everyday. Your marriage services bring us closer to God and to each other every time we listen to one. Awesome. The words of God!! And the ability to discuss Scripture and questions with friends that are also on the app is a good feature too. Messages, worship, news from my church. Love to have it all in one handy place! Love this app! So many great ways to engage with my church on the weekend and throughout the week. Thankful for this App-all things in one place and easy to use! Now I'm able to be more connected during the weekend service and throughout the week. Sometimes you need a Thursday afternoon pick me up. This is it! 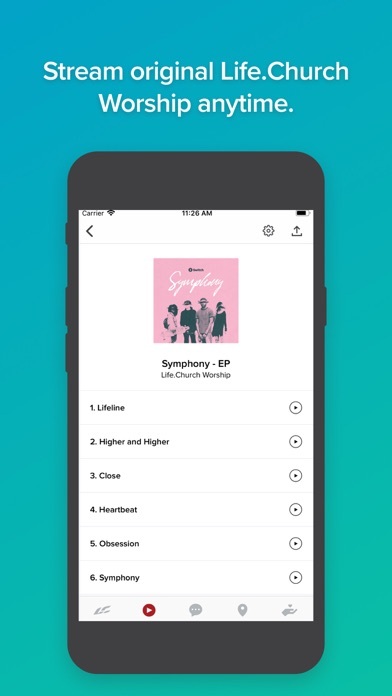 I love the redesigned Life.Church app. 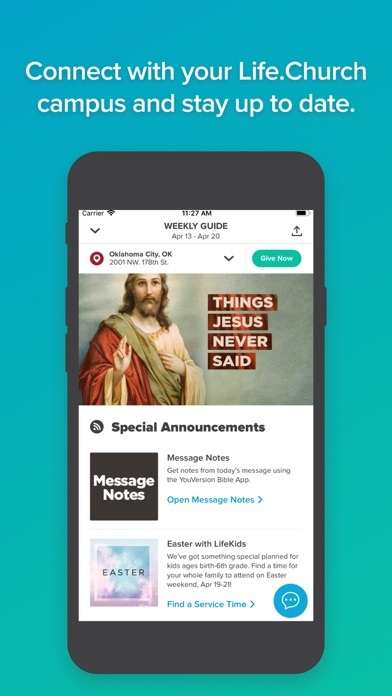 I feel even more connected to my church by using the Weekly Guide feature and having access to previous messages, all within the app. Everything I need for the church service is found on this app plus much more. Simple to use. This makes me happy. Simple, effective app. Love it! I absolutely love Life.Church and now it's even better with this app. Listen to messages, get awesome scripture art and more! Check it out, you won't regret it. Love this app and Life.Church! The update makes it even better! The new update to this app is fantastic. It helps me keep up to date with what's going on and let's me find any past sermon so easily. Love being able to find all the info I need at anytime! 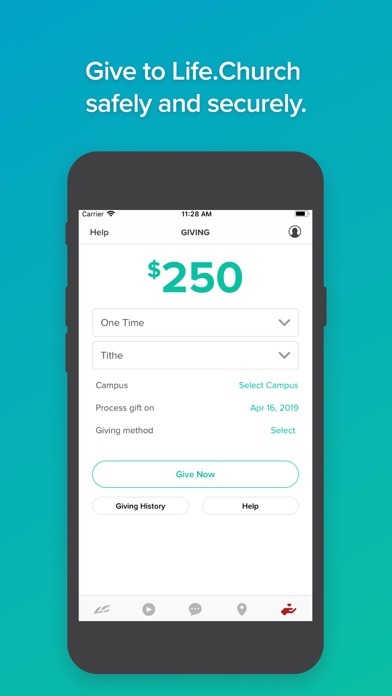 So easy to connect with my own campus of LifeChurch and with video, info, & the Bible App. Great job!! The content from LifeChurch has always been amazing. Now it's all here in an app! So excited! Anyone else notice the verse of the day image pulled in from the Bible App? Thanks LifeChurch! This was a fantastic app before, but now with the Weekly Guide and ability to digitally invite...its at a whole new level. Thanks so much for your irrational generosity Life.Church!!!! Love the Life.Church app! It's easy to stay up-to-date with the events at our campus, and it's great to watch past messages! I like being about to access all my campus' events from my phone! I love that I can now communicate with my campus and follow along with Pastor Craig's message right from my phone! So cool! Love the new "Weekly Guide"! Very powerful app and VERY done. Excellent! This app hits all the things that keep me in touch with Life.Church. Things like sermon video from Craig Groeschel, fun verse pics, and a map of their locations. Love. Being able to connect through the communication card feature is my favorite! Thanks Life.Church!! Everything is easily accessible now!!! Love being able to see the set list and easily navigate the series!! 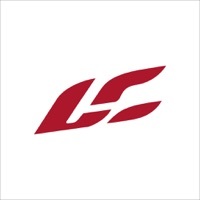 THANKS LC! The church is not a building or a place we go. WE are the church and we exist for the world. This app helps me stay connected and helps me strive to be a fully devoted follower of Christ. Love the new design that utilizes all the amazing native Apple elements. Plus the features in this app keep getting better and better. Easy to use and great content! Love this app and love our church! Easy to use, keeps you updated on what's going on. Loving all the changes and updates to the new app. So user friendly! My husband and I love love love Life Church, it is truly a Blessing!!! Love having access to sermons. When in travel it's great to listen to a favorite message or one I missed. Highly recommend it for life! This is a nice app to find a local location. The giving side does not work. It would be a very convenient way to give/ donate.